Riddle: When is a translation of a book not a translation of that book? 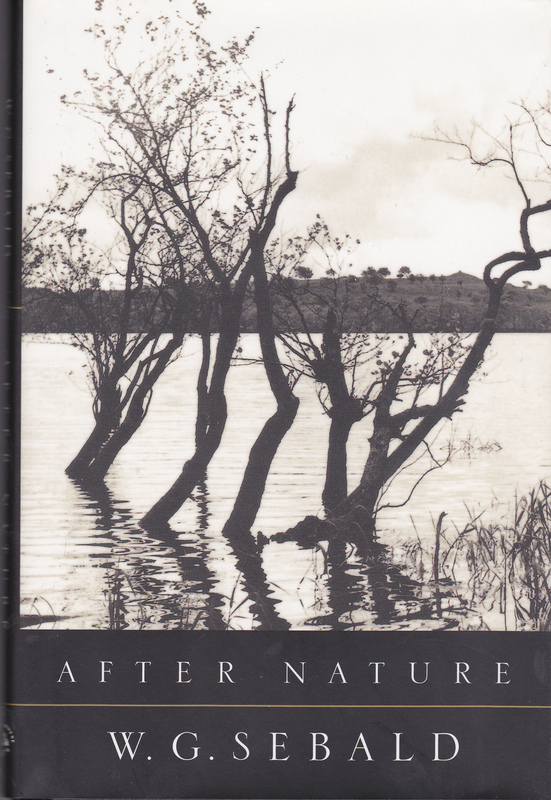 The earliest hint is buried in tiny print on the copyright page: “Published in English with additional material by Hamish Hamilton 2011.” Despite the similarity in their titles, the recently released English volume Across the Land and the Water: Selected Poems 1964-2001 by W.G. 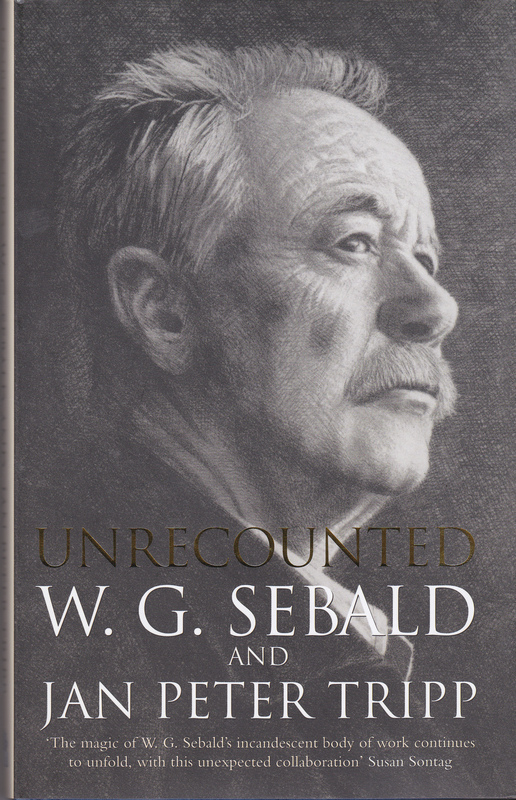 Sebald is dramatically different from it’s German counterpart of 2008 Über das Land und das Wasser, which was edited by Sebald’s longtime editor Sven Meyer. Across the Land, edited and translated by Iain Galbraith, contains considerably more poems, but, puzzlingly, they are incorporated within a different structure. 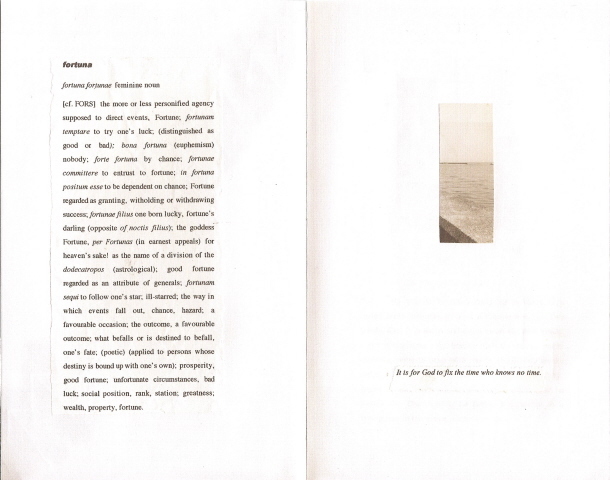 Across the Land has five sections: Poemtrees, School Latin, Across the Land and the Water, The Year before Last, and the oddly-named Appendix, which contains two poems that Sebald originally wrote in English. The German version has three sections: Schullatein, Über das Land und das Wasser, and Das vorvergangene Jahr, each of which is different from its English counterpart. 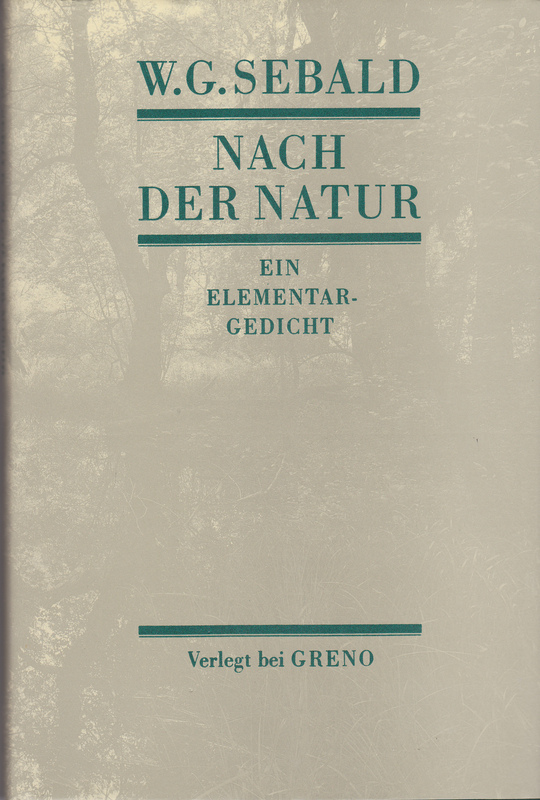 The English edition contains every poem from the German edition – except two: Analytische Sommerfrische and Physikalisches Wunder. If I am reading Galbraith’s introduction correctly, his reshuffling of the poems is based upon the manuscripts in Sebald’s archive at the Deutsches Literaturarchiv Marbach. 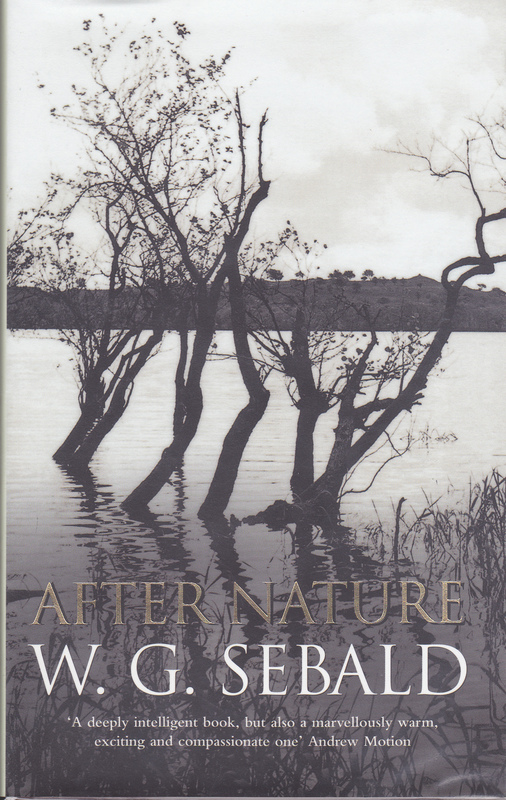 Furthermore, Galbraith seems to have made at least some of his translations from Sebald’s manuscripts (where multiple version of the same poems can be found), rather than from the German edition of Über das Land und das Wasser. This means that one cannot reliably compare Galbraith’s English translations with the published German version because Galbraith and Sven Meyer were, on occasion, using different source manuscripts for their respective editions. It is very conceivable that every time that a poem was shuffled from one section in the German edition to a different section in the English edition, Galbraith and Meyer were using different manuscript versions of the same poem. Riddle: When is a translation of a book not a translation of a book? Answer: When the translator works from a different set of manuscripts. W.G. 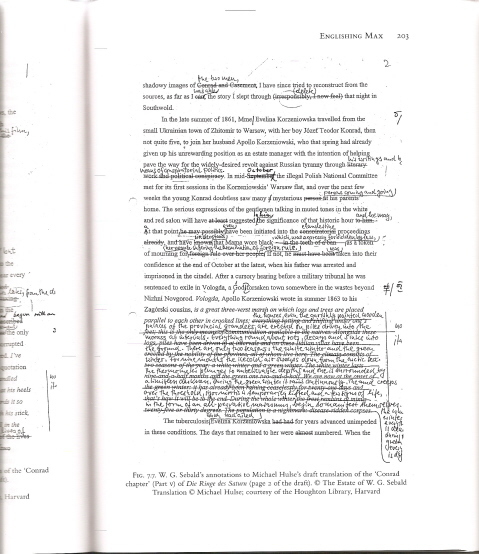 Sebald’s annotations to Michael Hulse’s draft translation of the ‘Conrad chapter’ (Part V) of Die Ringe des Saturn. The other night I continued to make my non-sequential way through Saturn’s Moons: W.G. Sebald – A Handbook by reading short accounts written by two of Sebald’s English-language translators: “Englishing Max” by Michael Hulse and “Translating W.G. 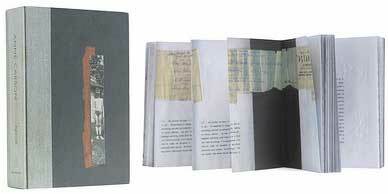 Sebald – With and Without the Author” by Anthea Bell. A fair amount has already been written about turning Sebald’s German into English, a process that always involved the considerable participation of Sebald, who, of course, was extremely articulate in English. The two essays in Saturn’s Moons add to the well-established image of Sebald and translator collaborating almost as equals. As the illustration above shows, Sebald was perfectly capable of rephrasing – or even completely rewriting – the work of his own translator, which might well have been unnerving for those who took on the task of “Englishing” his German. But Hulse provides a rare glimpse into the break-up of their professional (and personal) relationship that seems to expose a rarely seen side of Sebald. Having already translated Die Ausgewanderten into The Emigrants in 1996 and Die Ringe des Saturn into The Rings of Saturn in 1998, Hulse “agreed against my better judgment to translate Schwindel. Gefühle,” which, in 1999, became Vertigo. Hulse says he had already heard reports of Sebald complaining in public that he had had to “correct” Hulse’s translations. Hulse, who was juggling multiple literary projects at once, also sensed that Sebald thought he slowed the translation process down too much. Eventually, Hulse says, he informed Sebald’s publisher (Harvill) that he would not translate Sebald’s next book. In January 2000, Sebald wrote Hulse to say that “Perhaps you would agree that, from your point of view also, our partnership has now reached its limits.” After that they never communicated again. This admission by Hulse immediately reminded me of Michael Hamburger’s oddly confessional “Translator’s Note” at the beginning of Unrecounted, the book of poems that he posthumously translated from Sebald’s German in 2005. Although Max Sebald had given me copies of all his books published since our first acquaintance, he never so much as mentioned the writings of these miniatures to me and gave me no copy of For Years Now [the 2001 book in which some of the same poems had been previously published in English, apparently translated by Sebald himself]. In an intriguing aside, Hamburger mentioned that his wife had received an autographed copy of the English edition of Austerlitz that, surprisingly, “contained emendations in his hand.” Was Sebald unhappy with aspects of Anthea Bell’s translation, as well? Bell, who has both written and spoken in interviews about her experiences with Sebald, has never hinted at any issues. 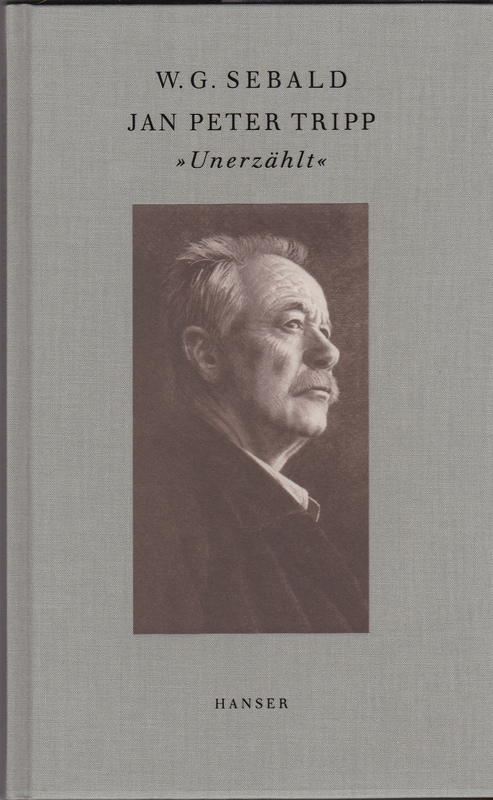 Table-ronde W. G. Sebald /Traduire…. a recent radio program about W.G. Sebald is currently available as a podcast on the Radio France website. The program, which aired March 14, 2009, is a discussion between two French translators, Christophe Claro and Bernard Hoepffner. 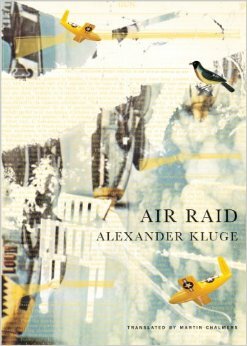 Claro has translated a number of contemporary American writers, including William H. Gass, William T. Vollman, and Thomas Pynchon. Hoepffner has translated fiction by Robert Coover, Mark Twain, Gilbert Sorrentino, and many others. (I’m told that this interview will be moved to a Radio France archive site after a while. So if the link stops working, please leave me a comment and I’ll find and post the proper archival link.) Listening to the program requires RealNetworks RealPlayer. There’s also a nice interview with Claro primarily about translation at The Quarterly Conversation.